Sometimes you need a thick skin to be a scientist or scholar. Almost everyone, it seems, has encountered a reviewer who didn’t bother to read what you wrote or badly misunderstood what you said. In other cases, you realize on reflection that a reviewer’s criticisms, although annoying and even painful at first, are justified in whole or in part. Addressing the reviewer’s criticisms helps you improve your paper or grant. That’s been my experience in most cases. Sometimes, though, a reviewer just doesn’t like your work. And occasionally they can be pretty nasty about it. 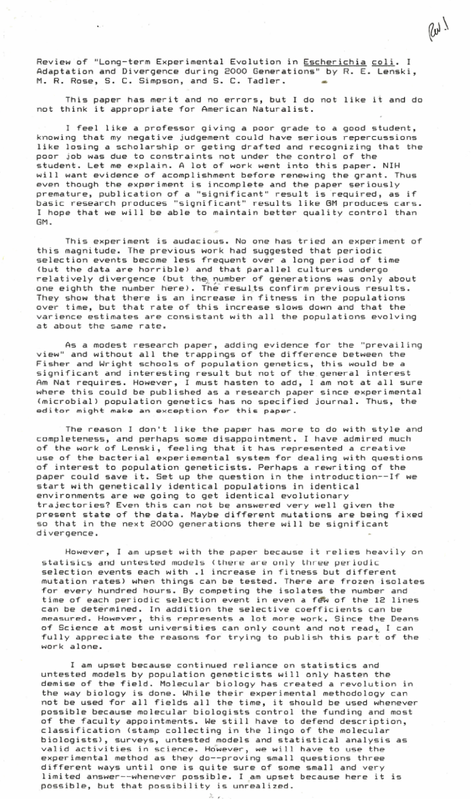 Here’s a case that I experienced on submission of the first paper about the Long-Term Evolution Experiment. I’ve occasionally shared this with members of my lab when they get difficult reviews to remind them that it’s not the end of the world or their career, or even the paper that has been scorched. PS The revised paper was accepted by The American Naturalist. In fact, it won the best-paper award there for the year in which it was published. It has also been cited hundreds of times.